Seraphina Dombegh has reason to fear both sides. An unusually gifted musician, she joins the court just as a member of the royal family is murdered in suspiciously draconian fashion. Drawn into the investigation, Seraphina works with the captain of the Queen’s Guard, the dangerously perceptive Prince Lucian Kiggs. While they begin to uncover hints of a sinister plot to destroy the peace, Seraphina struggles to protect her own secret, the secret behind her musical gift – one so terrible that its discovery could mean her very life. In her exquisitely written fantasy debut, Rachel Hartman creates a rich, complex, and utterly original world that reason will remember long after they’ve turned the final page. After reading the songs of praise from authors, book bloggers, and other critics – and learning that the sequel Shadow Scale is due out next March – I decided it was finally time to take flight with Rachel Hartman’s debut novel Seraphina. And what a sweet, intelligent story this turned out to be! Not only does Hartman offer a compelling new take on dragons, but she also proves that YA fantasy doesn’t have to be action-packed or overly romantic to keep readers in suspense and turning the pages. 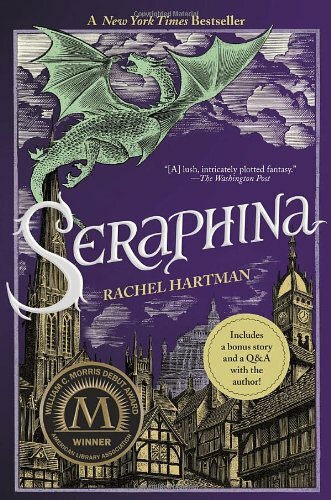 So much of Seraphina’s plot involves the protagonist, Seraphina Dombegh, keeping a monster of a secret: She’s half-human, half-dragon – and half-breeds are considered an abomination by both sides of Goredd’s human-dragon quarrel. With her new position as the royal family’s assistant musical director, Seraphina finds it increasingly difficult to not only conceal her truth, but also accept herself for who she is. For example, she’s repulsed by her patches of scales (which she covers with her clothing) and ultimately herself. This theme of self-acceptance is what I enjoyed most about this novel. In some ways, I could see myself in Seraphina, since I’d experienced similar struggles as a teenager. So, I was pleased to see what starts as Seraphina’s means to protect herself evolves into a journey of compassion, identity, and self-validation – lessons that Hartman’s target audience will relate to and embrace. One more area where Hartman excels in Seraphina is character development. Seraphina in particular is a well-rounded heroine. She’s clever, caring, wry, and stronger than she realizes. She’s also wary, self-effacing, and a little too curious for her own good. Her passion for music can be felt through her intricate descriptions and emotional reactions; and since I love music, it’s such a pleasure to see this kind of literary character brought to life. Oh, and the secondary characters! Orma grew on me as the novel went along, especially as he battles his own internal conflict. Basind’s ineptitude of everything from dragon-to-human transformation to basic social skills was a constant source of giggles. And the major character twist regarding General Imlann’s human form? Well, I guessed two different characters and was wrong both times, so Hartman deserves credit for fooling me there. Finally, while I liked Prince Lucian and Princess Glisselda but was disappointed by their initial one-dimensionality, Hartman redeems herself by letting both royals evolve late in the book and show new sides of themselves. So, why only a 3.5 out of 5? For me, Seraphina gets off to too slow of a start. After introducing the main conflict, Hartman spends a chapter and a half on backstory. OY VEY. I agree that the information helps readers understand Seraphina and her past, but it would have been less overwhelming to have it sprinkled throughout the novel instead of dumped all at once so early on. Several chapters passed – or rather, crawled by – before the story recovered and hooked me in again. Also, the excessive use of adverbs annoyed me after a while. That use is likely part of Seraphina’s intellectual “voice” as a narrating character, but it made me feel detached from her at times. Have you read Seraphina? What did you think of it? If you haven’t read it yet, do you think you might check it out based on what you’ve read above? Let me know by commenting below or visiting the same review at Amazon or Goodreads. Been meaning to read this for ages, now that I think of it. I’ve heard a lot of good things about this novel before, and this review sums many of them up nicely. I particularly like the sound of the music angle the book seems to have going on, since it’s not something I’ve come across before. Guess I’ll be making this the next thing on my list :). It’s a very sweet story, TPG. I hope you like it! Do you think you’ll review it once you’ve finished it? Definitely; I look forward to doing so. I enjoyed reading this review! It’s been a while since I read “Seraphina”, but your review reminded me what I enjoyed about it. I agree about Seraphina’s character – I seem to remember she had an edge over normal young adult female leads. Thanks for writing this! I just finished this and felt the same way! My only problem was that I read it directly after the first three books in the Lunar Chronicles, in which Cinder has the same basic storyline. I haven’t read the Lunar Chronicles yet. Who wrote those books? They are by Marissa Meyer and are fantastic! And I really enjoyed both of them for very different reasons! I would definitley recommend both, just not back to back! I’ve wanted to read this one! I didn’t think there was much else that could be done with dragons. I like odd ball characters. Political intrigue is always great in books. It’s nice to find a book that isn’t all violence and romance. You laughed too? Okay I need to get to this one. Yeah I dislike slow back capping starts too. I totally forgot to stop by and read your review of this! I also think that the beginning was a bit slow but I didn’t really have any expectations going in so I was pleasantly surprised with everything, ha. Also agree that the character development was great!